WASHINGTON (CNN) -- Secretary of State Hillary Clinton embarks Friday on a six-day trip to Europe and Russia that comes at a crucial time in the Obama administration's decision-making on a strategy for Afghanistan. 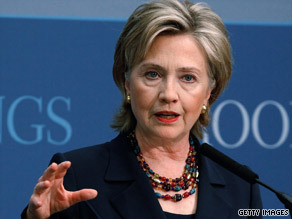 Secretary of State Hillary Clinton embarks Friday on a six-day trip to Europe and Russia. She will depart one day after the inaugural flight of the "lethal transit" agreement, signed in July by President Obama and Russian President Dmitry Medvedev, which allows transport of military personnel and equipment across Russia to support the U.S.-NATO mission in Afghanistan. On the trip, the secretary will confer with key allies about Obama's emerging strategy on Afghanistan and Pakistan, said Phil Gordon, assistant secretary of state for European and Eurasian Affairs. Meetings are planned with the French foreign minister, the British foreign secretary and prime minister, the Russian foreign minister and Medvedev. She also will discuss the next steps on Iran and North Korea and international efforts to have the two countries end their nuclear programs. Clinton also will highlight two enduring conflicts that have come or are coming to a close: one in Northern Ireland and the other involving Turkey's relations with Armenia. In Northern Ireland she will underscore both the peace process and economic development. The United States now has an economic envoy to Northern Ireland and a U.S. delegation of business leaders will accompany Clinton to Belfast. In Zurich, Switzerland, she will attend a signing ceremony normalizing relations between Turkey and Armenia. Relations between the two were disrupted 16 years ago over Armenia's occupation of Nagorno-Karabakh, an enclave in Azerbaijan. Gordon called the signing a "historic step" that will "contribute to peace and security throughout the region." However, the parliaments of both countries still must ratify the agreement and a senior State Department official -- authorized to brief reporters without attribution because of diplomatic sensitivities -- said the situation remains "difficult." "There's opposition both in Turkey and in Armenia," the senior official said, "but both governments realize ultimately it's in their interest to have normalized relations and an open border after years of tension and the economic isolation, particularly of Armenia." The centerpiece of the trip will be Clinton's visit to Moscow. At the top of the agenda is working toward an agreement to take the place of the Start II arms control pact, which expires December 5, as well as the newly created bilateral presidential commission that is working on a broad range of issues, from arms control to health. A senior State Department official said the negotiating teams working on Start are "making good progress ... but there is a lot of work that has to be done in a short amount of time." The official said there are sticking points on delivery vehicles -- the missiles that carry nuclear bombs -- and the number of warheads. In Moscow, Clinton will meet with human rights and civil society supporters. The State Department official said she will raise the issue of recent slayings of journalists in Russia. She also will discuss Russia's incursion into Georgia, an issue that he said "is not satisfactorily settled." During a stop in Kazan, Russia, Clinton will highlight interfaith cooperation. She will solicit ideas from religious leaders, young Muslims, exchange students and others on how to bridge the divide between faiths. Kazan is the capital of Tatarstan, a majority-Muslim part of the Russian Federation. Her trip will begin in Zurich, then move to London, England; Dublin, Ireland; Belfast, Northern Ireland; Moscow and Kazan. She will return to Washington on Wednesday. According to the State Department, Clinton has visited 34 countries and flown 130,748 miles since becoming secretary of state.